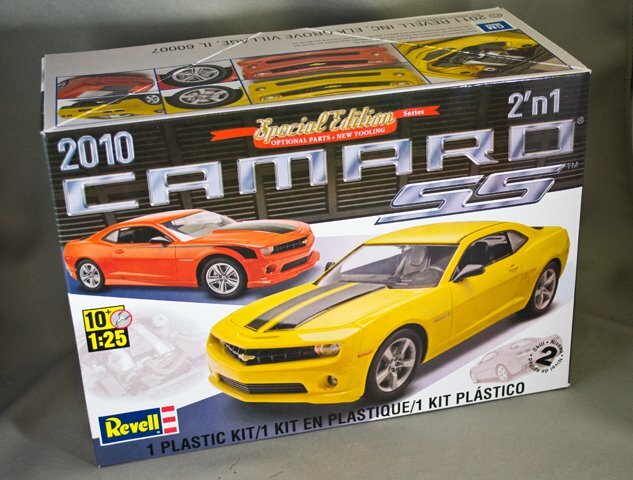 (Above) Revell's 2010 Camaro kit is another example of why Revell still is known for producing excellent model car kits! 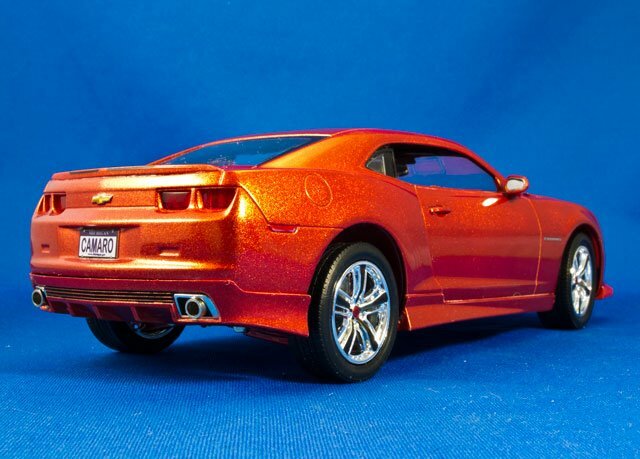 This kit features beautiful details that replicates the beautiful Camaro perfectly. 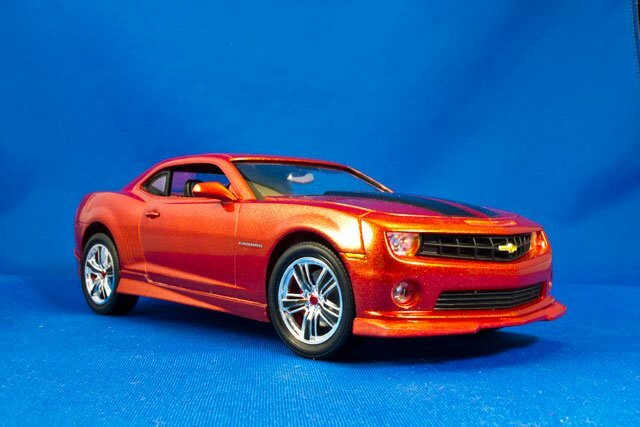 I wanted to build the kit box stock so that our readers could see exactly what they're getting in the kit, but I wanted to paint it in a way that would make it stand out from the rest of the Camaros out there. 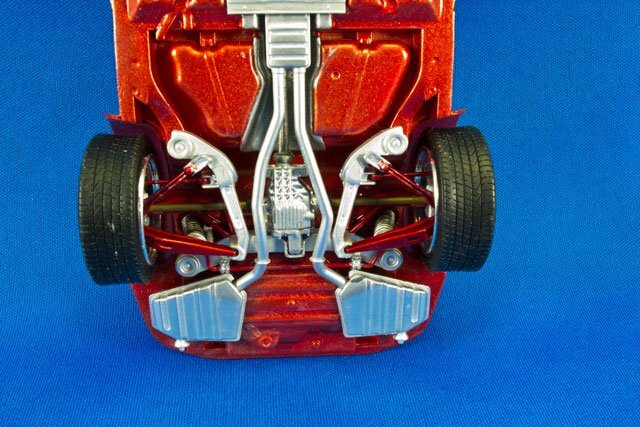 (Above & Below) The kit's motor features crisp details that can be brought out with just a little paint detail work. 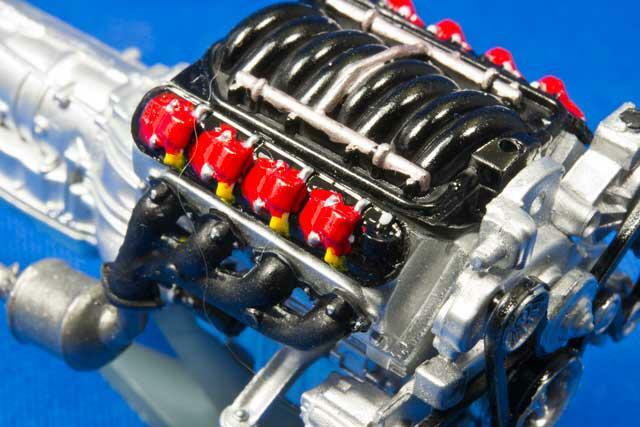 The majority of the motor was painted in Alclad aluminum. 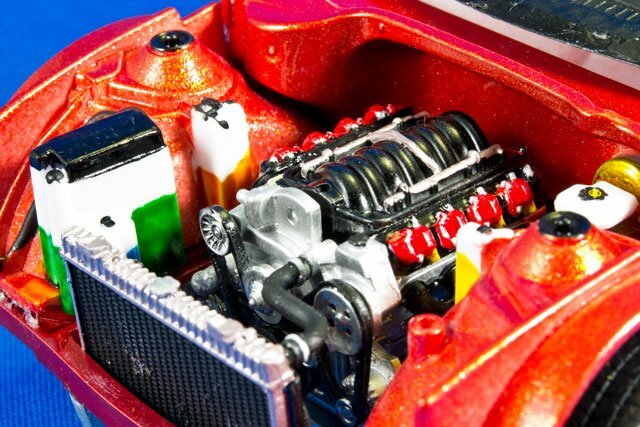 The top of the motor features valve covers and a intake manifold painted in semi-gloss black. 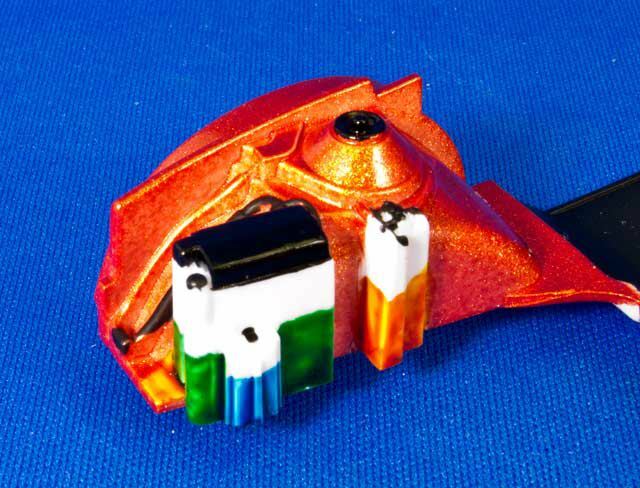 The coils are painted gloss red with yellow plug wires. 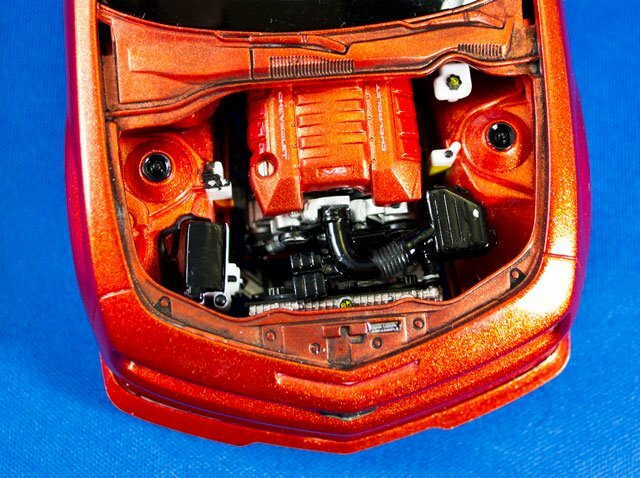 The engine cover was painted in the cars body color. 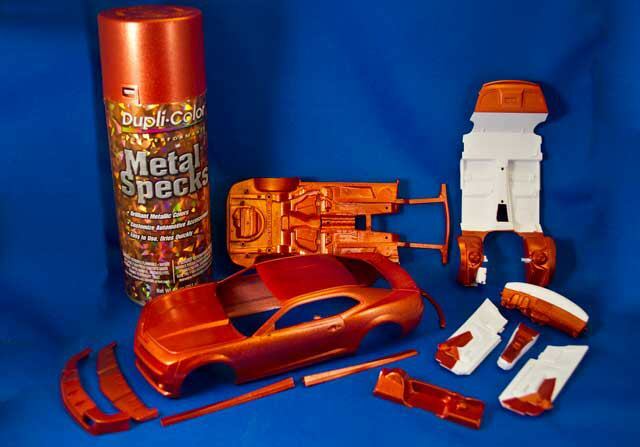 (Above) Dupli-Color's Metal Specs orange over their flat white primer was used to paint the car. 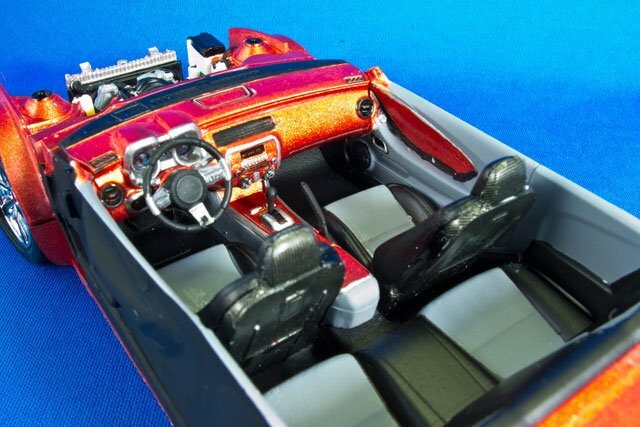 To give the car more of a "custom" look I painted a section of the door panels, center console, and the dash body color. After the Metal Specs was dry I baried it in their clear coat. It was block sanded with fine paper and then rubbed out with Novus three step polishing compond (available at TAP Plastics). 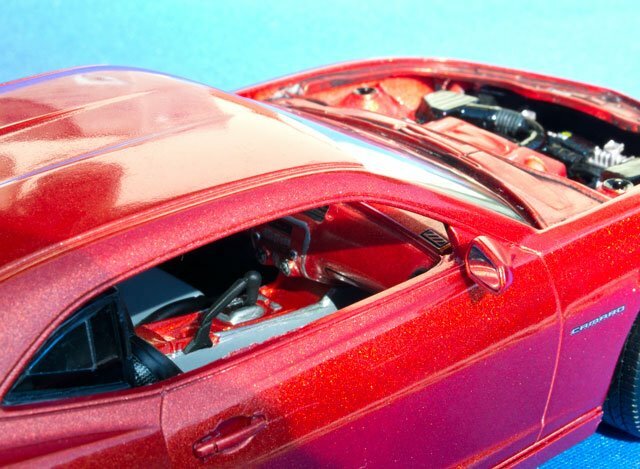 (Above) The plastic tanks on the passenger fenderwells were masked off before painting the body color. Then Tamiya's transparent colors were used to simulate the different fliuds. Semi-gloss black was used to paint the caps. (Above) The interior was painted in gray primer and flat blacks. The outside of the interior tub doesn't have to be painted, its just a weird habit of mine. (Above) It's almost a shame to cover up the motor detail with the engine cover. So I didn't glue mine down. I usually display it with the hood and engine cover sitting in front of the car. 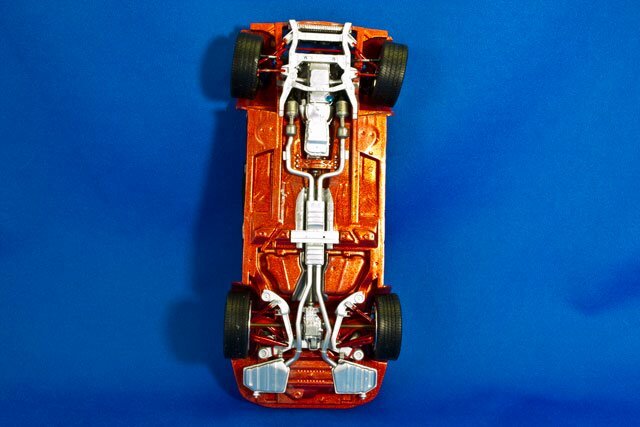 (Above & Below ) The two suspension cradles are aluminum so I painted them in Alclad aluminum and the A arms were covered in transparent red (to make them look like they're anodized). 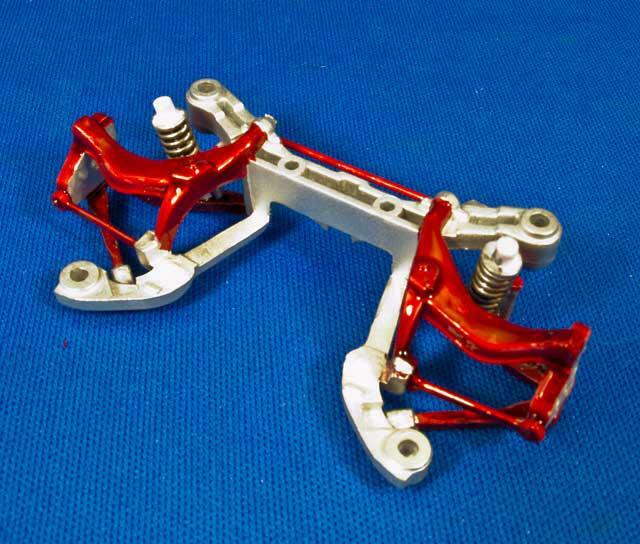 Sway bars were painted in the transparent red as well. 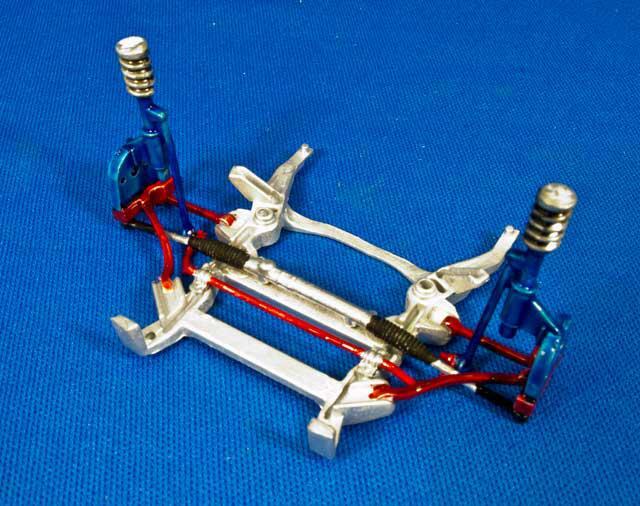 The struts were done in transparent blue. 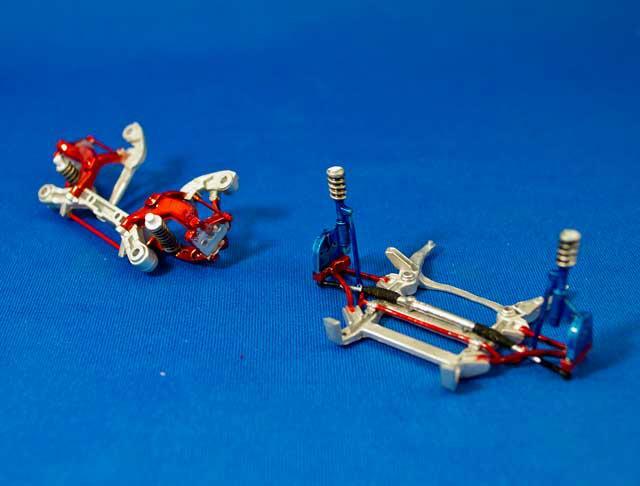 (Above & Below) The completed chassis is nicely detailed right out of the box. But with a little paint and time you can really bring it to life. 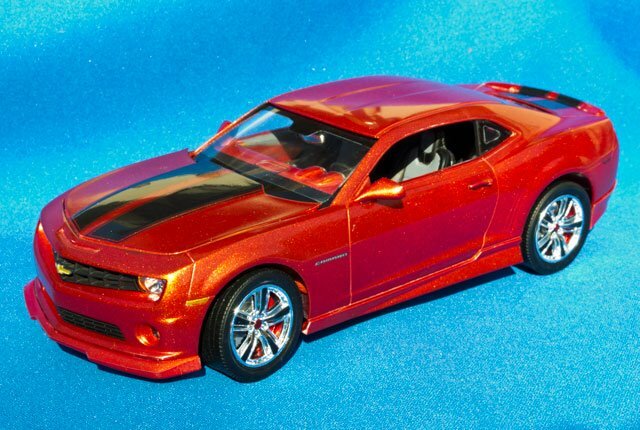 By painting the chassis body color and using the red and blue transparent colors, the chassis now looks like a custom pro touring car rather then a stock chassis. (Above) A closer look at the interior, I like bringing the exterior color inside. 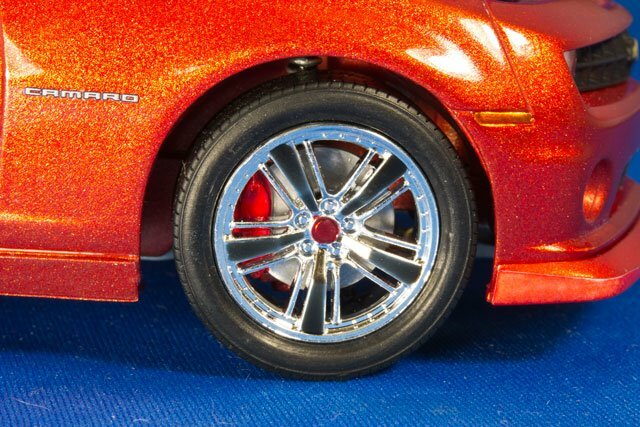 (Above) The custom wheels were a little too "chromey" for me. To tone them down a little I used Tamiya's "Smoke" paint to tint the center spokes of the wheel. The transparent red is used on the center cap. Final Thoughts; this is nice kit that goes together and features some beautifully molded in details. 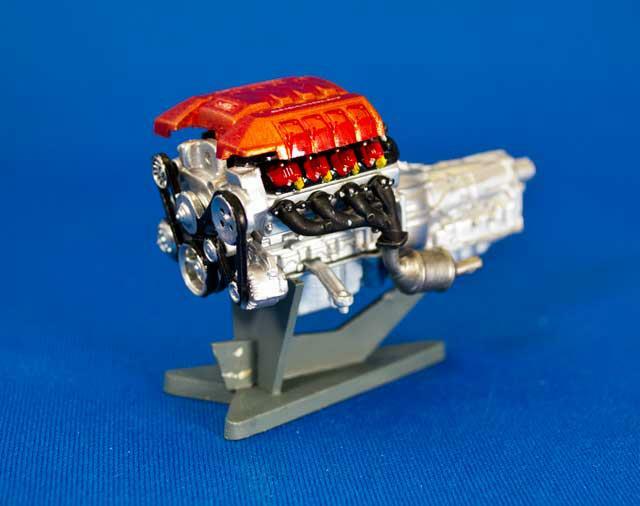 The motor alone is a nice display piece, almost hated putting it down in the chassis, should be on an engine stand. 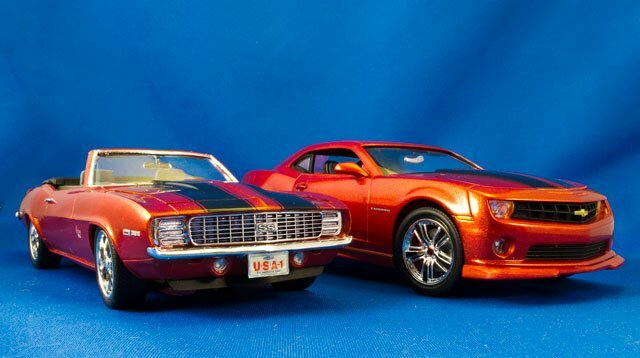 I built this model as a companion piece for the box stock '69 Camaro I built in Model Car Builder no.7 (page 12). They look great together.